Bruce Bawer thinks Europe has a problem with Islam and Leftism, and he's not wrong. But Bawer is an American Neocon poster-child, a peer among a very influential cadre of authors fixated on some supposed "global" clash between fundamentalist Islam and Western Civ, such as Bat Ye'or, Robert Spencer, Andrew Bostom, Claire Berlinkski, Melanie Phillips, and Mark Steyn. 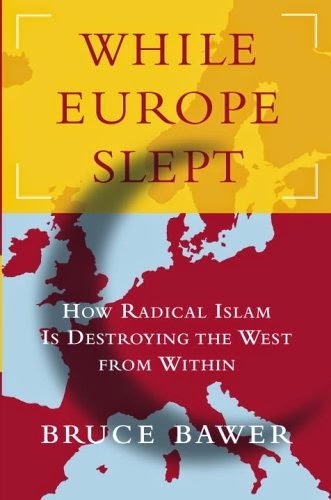 In his best-seller book, While Europe Slept: How Radical Islam is Destroying the West from Within (Anchor Books, New York, 2006), Bawer critiques the facilitation of Islamism in Europe by Leftist PC Elites, the rise of anti-Semitism, and the rapid growth of fascist populist groups. He strongly advocates American-style neoconservative solutions to these problems. The following paper provides a brief overview of Bawer's assessment of these political movements, and then critiques his proposed methods to overcome anti-Semitism, fascism, Leftism, and Islamism in Europe. The political and social reality of Europe today is characterized by the inundation of a foreign religion into the public sphere. Islam in Europe represents the re-insertion of an ultra-conservative patriarchal religion into European politics and public life after a long process of separating the traditionalist Christian religion from Western foundations, law, social relations, and public order in manageable ways conducive to individual rights and rule of law. But Islamism, with its literal reading of the Koran, its emphasis on collective religious identity, its insistence on the unity of public and private realms, and its anti-Westernism, is now pushing its way into mainstream secular Europe. How did Islam arrive in the public sphere in Europe? Why are Europeans the recipients of the physically damaging aspects of Islam and the insidiously destructive processes of Islamization? Bawer explains in While Europe Slept that the European establishment Elites are 1968-era PC Leftists (cultural Marxists) who are responsible for initiating massive immigration from the Muslim world into Europe and for introducing segregating multicultural policies based on immigrant ethnic minority group rights, which have enabled distinct Sharia-abiding communities to arise all over Europe. As these separate Muslim communities grew and radical Islam developed, the Elites looked the other way while the establishment media glossed over any problems. Leftists, Bawer says, explain all problems that exude from Muslim communities in Europe in neo-Marxist terms; they frame European discrimination and racism, American-led military interventions in the Middle East (particularly the wars in Iraq and Afghanistan and the controversies surrounding Abu Ghraib and Guantánamo, but also the oil-hungry interests of the West), in terms of the Israel-Palestine conflict. The Leftist European Elites are also what Bawer calls "Dhimmis": "non-Muslims whose lands had been conquered by Arab Muslims" and who "'flatter their oppressors'." As they entered the European establishment in the 1970s, the 68ers began their overall capitulation to Islam (dhimmitude) with the advent of the post-OPEC crisis Euro-Arab Dialogue (EAD), a project that favoured massive Muslim immigration and the promotion of Islamic culture in Europe. This EAD is a "political, economic, and academic collaboration between the European establishment and Arab governments. "6 This project has led to an ever-increasing Islamic Europe: major and widespread construction of Islamic schools (madrassas) and mosques (some with loudspeaker calls to prayer), thousands of shrouded women in public, halal compliant school dinners and restaurants, mass Muslim prayers in the streets, segregation by gender in schools and university lectures, Islamic studies, Muslim-only neighbourhoods, capital cities being referred to as "Belgistan" or "Londonistan;" Muslim political parties in Europe calling for the Islamic State and Sharia Law, and Mohammed becoming the #1 baby name in several major European cities. Europe is being transformed into what Bat Ye'or calls "Eurabia" and the Leftist Elites are responsible. Although one can agree with a great deal of Bawer's assessment of Islam in Europe and Leftist Elite complicity in this affair, While Europe Slept has key ideological faults that threaten European nativist cultural impulses. Let us now examine them. The assertion that the American New Leftists grew up and assimilated into the American establishment is plainly false because Leftist subversives have become the American cultural establishment as seen in American universities, schools, media, and PC governance. Yet this comparison of America with Europe, the superior "savior and protector" America to the inferior, backward, and dependent-on-America Europe, is arrogantly present throughout Bawer's whole book. He thinks America has a superior economy, superior immigrant integration models, superior ideals, a superior nationhood, superior military prowess, a superior culture, superior rights, superior individuality, and superior self-awareness compared to Europe, and that Europe must emulate these supposed magnificent qualities in order to support and further American global supremacy. as a heartless, bloodthirsty imperial power, barely indistinguishable from Nazi Germany and certainly worse than the Soviet Union" and have been "repeatedly...told that America had asked for 9/11 — that the atrocity had been payback for American militarism, neocolonialism, capitalist exploitation, and support of Israel. Out of all of this, Bawer thinks that the psychological effects of guilt, political correctness, and the Leftist explanation for militant Islamic attacks on the West, have resulted in the refusal of Europeans to engage in any form of conflict that may insult, offend, or discriminate against the Muslim 'Other' even if hat means losing everything, including their freedom, identity, and heritage. He writes, the 68ers "have sought to make [Europeans] feel ashamed of their heritage, contemptuous of their freedom, and willing and eager to settle for any kind of 'peace' at any cost." Although Bawer is not wrong in his assessment of how World War guilt and PC Leftism contributed to the weakening of European national identities and their facilitation of Islamism in Europe, the possibility does not seem to occur to him that many Europeans are not brainwashed but highly intelligent and capable of thinking for themselves, genuinely do not want to engage in war with foreign countries, actually do want to tackle Islamism in Europe but have no political representatives to serve these interests, are fed up with the eagerness of America's moral mission to spread democracy and liberty throughout the Muslim world by military force and the repercussions this has had for Europe due to its close proximity to Muslim-majority countries in the Middle East and North Africa, and honestly do not want to aid America in its quest for global supremacy. While Bawer rails against the Leftist omission/dismissal of the politico-religious element within Islam he himself omits/denies the antagonistic effects of Western military intervention in Muslim countries on militant Islamism at home and abroad. Although he critiques the guilt complex that has arisen out of WWII and PC and vilifies the Leftists for degrading European national identities, he himself uses guilt-tripping language and trashes European peoples, history, and ethnic nationalities while attempting to compel European action against Islamism and aid American global hegemony. And although he vehemently condemns PC Leftism (Islamophobia) he himself imposes a Neoconservative style political correctness (anti-Semitism and anti-Americanism) upon the European peoples while discussing Israel, America, and anti-Islamism. That was a great read, Ms. Ellis, thanks. "And although he vehemently condemns PC Leftism (Islamophobia) he himself imposes a Neoconservative style political correctness (anti-Semitism and anti-Americanism) upon the European peoples while discussing Israel, America, and anti-Islamism." It is a simple case of the pot calling the kettle black, as is usual with the tribe. Political correctness comes in two flavors, depending on who's serving. Weren't a lot of the American Neo-conservatives former Trotsky-ites from Russia? 1. I suggested to my son to read this guy. I like Bruce Bawer, I read that Europe book, and hold dear a copy of "Stealing Jesus." My son thought he was dropping a bombshell when he recently told me he was gay - hell, I knew that since he was three or four, and had to buy him a Ken doll because he felt left out of his older sisters' Barbie games. He got the wrong idea, and thought I don't like gays - truth is, I just don't care either way. It's none of my business what consenting adults do behind closed doors, and I see no problem with gay 1 on 1 marriage, as that doesn't really affect anyone else as far as I can see. It certainly doesn't interfere with my het lifestyle. No, I don't want to hear stories about what goes on behind closed doors, but that goes for everybody. BUT - I would be more than happy to fight on the side of the rights of Canadian gays over any retrograde religious crap, regardless of source. Yes, I find it mindblowing that Muslims use warning signs as invitations to violence. From what I remember of the Bawer book, and some news articles a while back, the Dutch tolerate sexual activity in parks, and warn passers-by that if they proceed further, they might see something they'd rather not, by the use of signs. A normal person would read this sign, and then decide whether or not to take his chances in proceeding, or to take a roundabout detour. Muslims took these signs to mean "People to beat up over here." Michael Lind claimed Neocons are linked to Trotskyism and Francis Fukuyama linked Neocons to anti-Stalinism. In other words, Leftists and Liberals who turned to the Far Right. Have you ever been to Europe?? Because here the first ones to defend the immigration, the "diversity" (including the acts of the islamic community) and to attack any patriotic movement... are the jews and jewish lobbies. I hate to say it, but Anonymous' argument overlooks a simple fact; namely, there are Jews and then there are Jews. He correctly describes the Internationalist faction that believed, and still believes, Jews can maintain their distinct identity if they weaken the nation state, support globalization and international organizations and rely on French style statements of individual rights. Then there is the Nationalist faction also called Zionists. They believe Jews can only maintain their distinct identity within a nation state. This is why they founded and are maintaining Israel in the face of violent local opposition. The Internationalists, who early on aligned themselves with the Communist Internationale, were the losers when Communism collapsed, but their second campaign through the schools and intellectuals, promoted by Cultural Marxists, has gone from strength to strength. So, in a very real way, what we are dealing with today is a civil war in the Jewish community played out on the world stage in which we, believers in Classical liberalism exercised by Europeans within the confines of the nation state, should be siding with the Zionists. We're nationalists; they're nationalists. We're believers in racial identity; they're believers in racial identity. And, to boot, we generally speaking use and adhere to their standards of morality. Why is this so complex for everyone to grasp? We believe in racial identity for all people. The Zionists believe in racial identity for themselves and all non-white races. You can't see that something is missing here? Please re-read what I just wrote. Zionism is about Jewish racial and religious identity. It's not about other non-white races, it's about Jews. It's the Internationalists who embrace multiculturalism. There's plenty of backup to these two statements, almost too much. "Civil war in the Jewish community"? Are you kidding, trying to be ironic? In spite of all the propaganda about anti-israeli Jews, there is not to be found on the planet, a people who speaks with a more unified voice than the Jews. I remember one of the propaganda pieces after the MV Mavi Marmara incident where the press was touting the Israeli backlash to the incident, reporting that DOZENS of people showed up to a rally in a hotel conference room to protest the murder and arrest of people on the ship. Meanwhile on various sites there was footage of what seemed to be the entire population of Tel-Aviv out cheering the IDF, and waving the Israeli flag. Dozens indeed. Also I notice how Mr. Bawer's book seems to indicate that to be pro-western one must also be pro-Israeli, when in fact it is Israel's supporters that have had the most pernicious and destructive effect on western culture. So, Ms. Ellis, when are you actually going to start your critique of this Zionist crap? Mr Hilliard, I believe you are mistaken on this matter. There are plenty of examples of prominent Jews who support a nationalist Jewish state in Israel while AT THE SAME TIME supporting multiculturalism in the Western world. One name that comes to mind is the billionaire Sheldon Adelbright, who recently told the Republicans they would only receive his funding if they supported amnesty and immigration in the United States, while at the same time supporting the restrictionist policy of the Israelis with regard to Arab and African refugees. Make no mistake, multiculturalism for Jews, as for most non-Europeans, is merely a tactic to advance their own group interests under the guise and rhetoric of fairness, equality, and lovey-dovey one-worldism. It is a well-known fact that Jews never hold the same standards for themselves as they do for gentiles, going back into Biblical times. This why anti-semitism has been so prominent everywhere Jews have lived, and why inexperienced and morally-absolutist Europeans are so easily to duped into serving Jewish interests. I would reply to Mr. Kellner that Jews who have not returned to Israel are "internationalist" by definition. The Zionists, the people who wanted a Jewish homeland, are in the Jewish homeland. BTW, I looked up Sheldon Adelbright and came up blank. Did you mean Sheldon Adelson, chairman and chief executive officer of the Las Vegas Sands Corporation, the 10th richest man in the world? @F. Hilliard: Sorry, you're right. I meant Mr. Adelson. I got his name mixed up with a character from a book I was reading. As to your claim that Jews living in the diaspora are by definition not Zionists, I'm afraid that is a definition which you alone share. I personally have met and spoken with a number of Jews living in Canada who are avowed Zionists and proud of it. Many are fanatical supporters of the state of Israel and, although they do not live there, they won't hear a word against their cousins in the Holy Land. If this seems strange to you, it's only because the concept of ethnic solidarity has become so unfamiliar among White Westerners that it's almost like speaking another language to many of us. Jews on the other hand, do not have this problem. Ethnocentrism is their native tongue. Well, some history then. Theodor Herzl founded the movement as a nationalist movement for the Jews. In his 1896 book Der Judenstaat, he envisioned the founding of a future independent Jewish state during the 20th century. He was so successful, the state of Israel was created in 1948 and today some 40% of the world's Jews live there. As nationalist movement go, this has very few equals as entire populations had to be moved from Europe to the Middle East to accomplish it. The Kurds, who resemble the Jews in many ways, have failed, over the years, to resolve their internal differences, throw up a charismatic leader and form their own country (although they're getting close). So, yes, I'll repeat what I said earlier: "Jews who have not returned to Israel are 'internationalist' by definition. The Zionists, the people who wanted a Jewish homeland, are in the Jewish homeland." We have all seen the difference in life, and in politics, of people who talk the talk and people who walk the walk. In the Jewish case; the people who really, really did believe in the creation of the Jewish state got up and went there, fought there, settled there, and had families there. They're Zionists. What were the others, the other people, the people who gave lip service, even money, even political support? They're internationalists because they believe it's possible to retain their Jewish identity in another country. To do that, they tend to be anti-nationalists, or globalists, and to support supra-national organizations.This is a really important point because it's all too easy to be so aggrieved at Jewish anti-nationalists that one fails to applaud and support Jewish nationalism. Look, I'm telling you from experience that this definition of Zionism you have come up with is not shared by any living Jew. Talk to some Jews in Canada, ask them if they consider themselves Zionist, ask them whether or not they support (or as you would say, believe in) a Jewish national homeland. Believing in a nation-state obviously does NOT mean that all members of the ethnic community must live there always. Anyway, you can define Zionism however you like, but your idea of Israeli Jews and diaspora Jews representing two factions in an inter-community 'civil war' is a complete fairy-tale. Why then do most (if not all) Jews and Jewish organizations in Canada and the US at all levels openly support Israel, stridently defend it from any criticism, organize fundraisers on behalf of Israelis, organize trips to send young Jews to Israel, etc...? For crying out loud, one of the largest political lobby groups in the United States, the American Israel Public Affairs Committee defines itself as a Zionist organization. Besides, if you really believe that Jews would ever support any European nationalist movement, then you're clearly more deluded than those who would ally with Islamic fundamentalists. I mean when have Jews ever been supportive of any European gentile nationalist movement of any kind? There already have been European nationalist politicians who thought as you did, and tried such a strategy, to no avail. As I recall, Pim Fortuyn's List, and the Swedish Democrats where extremely philo-semitic from the get go, and yet they never received any significant support from Jews, nationalist or otherwise. I really can't understand why you keep going on about respecting Jewish nationalism when Jews themselves would never respect yours. It just doesn't seem helpful to anyone. Is this just a truth that you can't come to terms with? I'm actually pretty happy with my definition because, as I said, it defines people by what they do, rather than what they say. True Zionists not only believe in the concept, they live the concept. Jews in the diaspora are giving lip service, money, support but they aren't so committed they actually get on a plane and immigrate. What they do, instead, is to try to tear down nationalists in other countries. This is exactly the other side of the internal argument in the Jewish community 120 years ago. The reason they're multiculturalists is that, historically, national movements have objected to Jewish business and settlements precisely because they were an anomaly in otherwise uni-cultural countries. To answer your point that "Jews and Jewish organizations in Canada and the US at all levels openly support Israel, stridently defend it from any criticism, organize fundraisers on behalf of Israelis . . " etc. I would say this is guilt money; guilt that they, themselves, didn't do Aliyah. Wikipedia says " Aliyah is also defined as "the act of going up" or as in progressing towards Jerusalem. It is one of the most basic tenets of Zionist ideology." Well, exactly. They didn't do Aliya and so they're paying for their failure of faith. But let's talk about us for a minute. We're going to fail as an organization if we fail to distinguish our friends from our opponents. Jewish nationalists are our friends, just as French and British nationalists. Jewish internationalists are not. We need to be clear headed about this because, down the road, we're going to need their help in combating charges against us of racism and antisemitism. Mr. Hilliard, I fear that we may have the reached the point at which rational arguments no longer have any value. But for the sake of limiting confusion let me restate my two main points: 1) The definition of Zionism that includes only Jews who have made Aliyah has no bearing on the real world. Many of the largest and most influential self-described Zionist organizations are based in the United States, the UK, and elsewhere in the Western world. Many (if not most) Jews in North America self-identify as Zionists. I mean right now, in our present age. Perhaps you might read The Israel Lobby by John Mearsheimer and Stephen Walt to get some idea of the position of American Jews on Israel. 2) There is no division among Jews, in the diaspora or in Israel, between those who support Jewish nationalism, and those who attack the nationalism of gentiles. Many Jews, privately and publicly, prominent and ordinary alike, support the existence of a national/ethnic Jewish homeland in Palestine, and simultaneously hold all the typical 'internationalist' views with regards to White gentile nationalism. Never mind the bigger names, such as Adelson, Schumer, Rosensaft that might immediately leap to mind, more to the point, the fact that you seem to believe that Jews are only nationalist or internationalist tells me that you have never spoken to any Jew in person about politics. Perhaps this is why you seem to have such a positive view of Jewish nationalism. Now let's analyse your responses to these arguments. " I'm actually pretty happy with my definition because, as I said, it defines people by what they do, rather than what they say. True Zionists not only believe in the concept, they live the concept." - How happy you are with this definition is irrelevant, because it exists only in your mind, and is not shared by most Jews in the West, particularly those active in politics. Likewise, you may think that being anti-nationalist with regards to other nations while at the same time being a Jewish nationalist is a contradiction -and from a highly universalistic perspective such as our own that may be true- that unfortunately also means nothing, since most Jews are content in being so regardless.
" Jewish nationalists are our friends..." - Do you have any evidence to back this statement up? Because all my life's observation, both first and second hand, suggest otherwise. I fear you have fallen into the old Westerners' trap of assuming everybody thinks as we do. Hence if in theory, Jewish and White gentile nationalists have similar goals, they must make perfect allies, right? Reality, once again, is far, far different. Jews have held double-standards, and harboured ridiculously ethnocentric grudges with regards to gentiles since ancient times. After WWII, Jews of all stripes and all ends of the political spectrum have you used what European nationalists allegedly did to them during that period as a cultural weapon to attack all feelings of cultural and racial pride among Europeans everywhere in all aspects of politics, academia and culture. The day Jews, Zionist or not, look kindly on an attempt by Europeans to reclaim their sovereignty is the day they all convert to Christianity and start apologizing for all the wrongs they committed against Europeans throughout history. And lastly: "we're going to need their help in combating charges against us of racism and antisemitism." - It boggles my mind that someone who contributed to this website could say something so incredibly foolish. Most anyone whose brain hasn't been swallowed by their television set can tell that you Jews use antisemitism as a tool to silence anybody whose positions they do not like. There will never be a time when European nationalists will not be labelled racists and antisemites. Can you seriously be so naive as to think that allying with Jewish nationalists will protect you from the antisemite, let alone racist, charge? Did it work for the Front National? Did it work for the Swedish Democrats? Did it work for the Vlaams Belang? Did it work for the Republicans in the United States? The answer to that should be painfully obvious. Just having a mostly White voter base is enough for Liberals to malign the GOP as the party of 'racist old white men'. The solution to slander is not to buy into its premise. You ignore it, or you embrace it. I'm not afraid of being called White, or racist, or antisemite. And if you really want to make a difference, then neither should you.